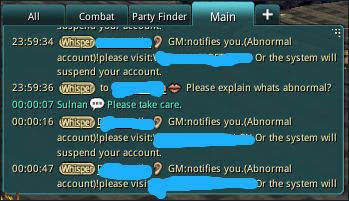 I been making a effort to warn all my friends, clan mate, and factions against these tactics by phishing bots that are posted out in the F8 Cross-Server Dungeons. Mostly located in Sogun's Lament and Nexus. 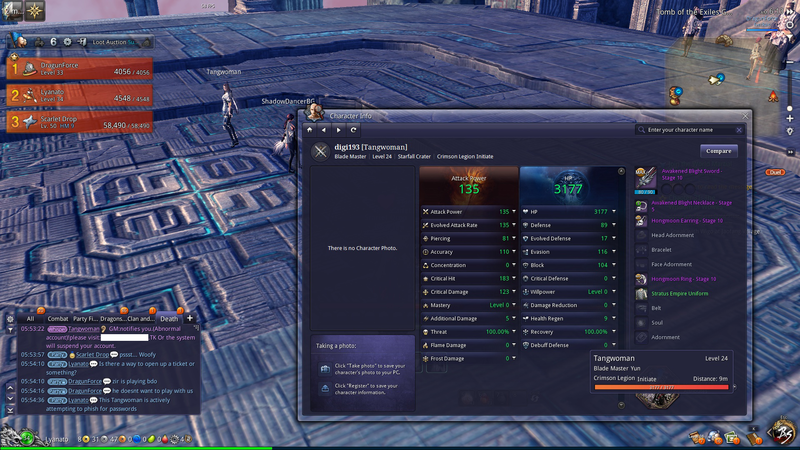 i was whispered twice in the cross server as a GM with $125 winner package. but the site looked suspicious even though there was ncsoft in it. so i whispered back "shut up bot"
Got hit this morning in cross. Reported it immediately. Just have to wait for NCS to drop the hammer. Just hope they can do something about the metric buttload of spam in faction/clan chat. Ran into a phishing bot at Mushins Tower on the Taywong Server. Already reported, but please be careful everyone. I logged on this morning to find in my mail the same letter that Ryonz received. Can you please confirm if its a scam. I have also gotten whispers saying your account wil get banned if you don't go to this website. and I report them. These scams seem to be getting more frequent. Is there anything that can be done to stop them? All these whispers / in-game mails are scams indeed. Besides reporting and blocking the spammers there is nothing else that can be done unfortunately. Just do not visit any address given to you in-game, don't reply to these whispers either. Use photobucket, w/e site you used for that image isn't working. Cross server Tomb of Exiles. Dark Soul LT - GM: notifies you. (Abnormal account)!please visit: [fake ncsoft website link] Or the system will suspend your account. This is getting totally out of control, just got a whisper in SSP.. couple of hours before that in dungeon lobby again. If you look at the character it is obviously a stolen account, gg and high lvl. There's actually a banner that within the Announcements window that pops up when you log on. I'll reach out to Customer Support and see if we can adjust the message of the day as well ("Welcome To Blade & Soul") in order to warn even more against phishing attempts. To other thread participants, please report scammers directly in-game (even if the account is legit), it isn't necessary to come to forums and post screenshots of chat logs as we cannot act on these from here unfortunately. Thanks again for your cooperation. I just submitted a report detailing what just happened to me on Yunwa. Someone posing as a GM sending a whisper...LOL. This is what they said: [character name] "GM: We are happy to inform you that you have won a $ 125 Pack form NCSoft. Please visit w ww. [censored].TK"
got sumthing similar to this they sent to my bf.... Id like to know if i can put down an report the site somewhere?...we went into jadestone and went to the back noticing they were hiding and wondering if it was a GM. My bf told me tht was the guy who sent him the whisper offer..an wondered if it was real. I wondered why they were hiding behind the building...which was off and bf checked regular site as i told him, to see if anything came up.. nothing. So he checked forums and noticed all of the comments here. Thank you guys. *^* Told my bf to report him while we were right in front...my bf reported, one person ran up and the "gm" decided to try an leave...so i reported at last min b4 he could, but under report as spammer. If we see anymore around..we'll report em...thanks again. Okay, these scammers are getting wise and bolder. When they contact you via whisper, their names are now GM ____ something. No longer does a player's name appear. So be aware of the fact that NCSoft does not contact players in-game as they stated. If you're contacted by these criminals, click on their name to open their profile, screenshot that with the PM they sent then report them. I just did that a few moments ago and received confirmation they acted immediately on this. Don't hesitate to nail these thieves. My opinion, people that are so rediculose unbelivable stupid ''giving away'' there Account info to simple ''phishers''. should NOT get support, get alot of there lost Gold back ect. Rather use that support to help players that 've not given away there stuff for free. Also when u see ''Mid geared, to high End Geared'' Players Spamming Phishing sites, these are likely account that players gave away for free to the owner of a Phishing site. Phishing arrived 1995, 1996 it got Well Known to most people using internett. and since 2001, its been well used in MMO's. used by scammers to try get less smart humans give away there account/Credit info by sending it. by typing in the info the Phisher is after. Unless the site was made by an Highly Exped Hacker, that has first hacked a Web site, made the Phishing site under there Authentic Domain. then hidden the phishing site there. Seriusly. Why are u giving back what they lose ? these ppl who give away there stuff/accounts. NCwest got Info about Phishing All over tha place. Go spend the time on player that acctualy got hacked, or player that need other support.